Recorded in the various spellings of Ovenden, Ovendon, and Hovenden, this is an English locational surname. It originates from either the village of "Ovenden" in the former West Riding of Yorkshire, or from the village of Ovingdean in Sussex. 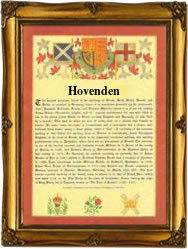 This latter village was recorded in the 1066 Domesday Book as "Hovingdene" and therefore it is easy to see where those name holders called "Hovenden" originated. The Yorkshire place name is recorded in the Yorkshire Fines Court register of 1246 as "Ovinden", and later in 1266 as "Ovendene". Ekwall's famous "Dictionary of English Place Names" gives the meaning for both places as "Ofa's valley", derived from the Olde English pre 7th Century personal name "Ofa", with "denu", a valley. The site of the Yorkshire village is very hilly, and more recent research suggests that the original meaning may have been 'upper valley' from the pre 7th century 'ufer denu'. Ekwalls research was undertaken between 1920 and 1940, and in some cases has been overtaken by a a deeper understanding of place name origins. Locational surnames such as this one were generally given to people who left their original homes to live in another area. The easiest way to identify a stranger in the small communities of the Middle Ages, was to call him, or sometimes her, by the name of the place from whence they came. Early examples of the surname recordings include: Necholes Hovynden of Ticehurst, Sussex, on December 23rd 1565, Samuel Hovenden of Brede, also Sussex, on March 16th 1594, and Robert Ovenden, who married Katherine Stovens at the church of St. Peter's, Cornhill, London, in 1601. The first recorded spelling of the family name is shown to be that of Ricardus de Ovenden, which was dated 1379, in the Yorkshire Poll Tax Rolls. This was during the reign of King Richard II of England, known as "Richard of Bordeaux" because he was born there, and who reigned 1377 - 1399. Throughout the centuries surnames in every country have continued to "develop", often leading to astonishing variants of the original spelling.